Irvine, a bedroom community in Orange County, is often spoken about as a homestead of possible Utopian living with green trees, cookie cutter homes, and maybe an ethnic market selling something as exotic as dark chocolate or unroasted nuts. In truth, it’s a thriving urban area with an incredibly diverse population – and food to match. Close to Disneyland, 10 miles from the Pacific Ocean, and roughly an hour and a half drive from the City of Los Angeles, resides Irvine, opened in 1965 as a “new town.” The area’s conception was a bedroom metropolis budding out of the 405-freeway connecting LA, OC, and San Diego counties. Its sole purpose was to be a pedestrian, and yes, a conformist archetype of 20th century modernism. Now, in the 21st century, ironically, it is the largest city in the continental U.S states with an Asian diaspora, ranging from Indian to Korean, Filipino to Chinese, Malaysian to Japan. 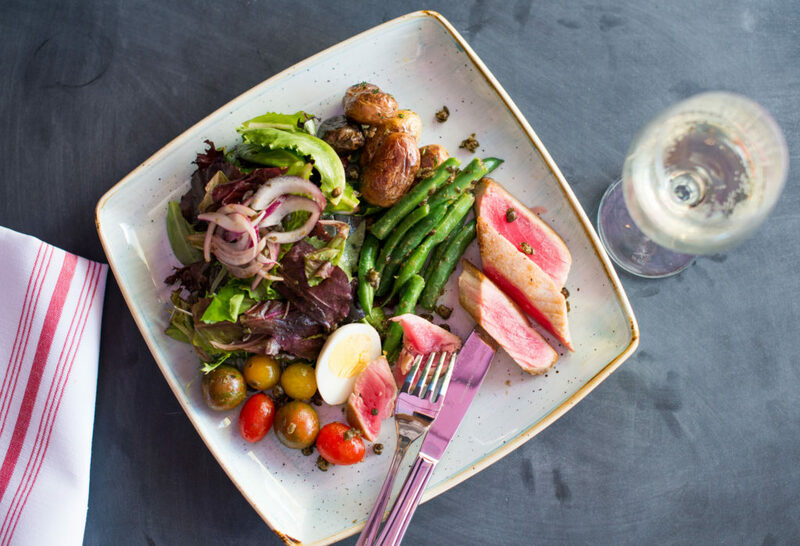 Irvine has become a blossoming food center, offering cuisine not only throughout Asia but Mexican, Italian, Indian, and Middle Eastern – and sometimes, a fusion of several. For residents, the town’s proximity is close enough to enjoy Pacific Ocean breezes from Newport and Laguna Beach without having to pay for the pricey coastal real estate, although that, too, is changing as it continues to grow. Indeed, the area measuring 65 square miles is home to several higher learning schools including University of California, Irvine, Concordia, Brandman and Chapman Universities, and has a median income of a little more than $93,000 per household compared to the entire state at $63,000. During the mid-sixties, people were the leaving urban centers for places like Irvine, which quickly become synonymous as a landmark of social and political conservatism. Often a hidden tag line, going to any city within Orange County such as Anaheim, Huntington Beach, or San Juan Capistrano was said to be “visiting behind the Orange Curtain,” a post-WW II reference to communist countries and much of the then area’s non-liberal viewpoint. Much of that has changed, as OCs head into the first quarter of the 21st century. Matter of fact, Irvine proudly stated that for the first time since WWII, the entire area went “blue,” attributable to the shifting and dying demographics that once reigned in the area. 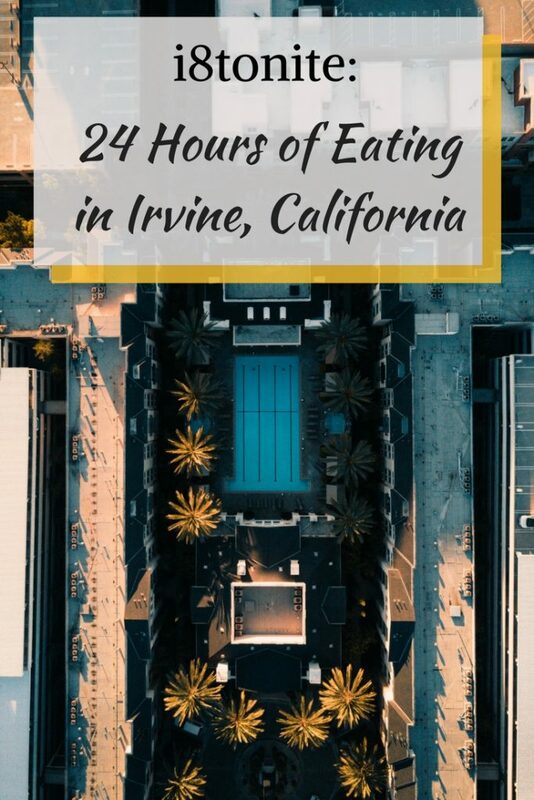 Now Irvine, also called “SoCal’s Silicon Valley,” is one of the leading centers of the state’s diverse eats and eaten by internet company denizens from Google, Houzz, Microsoft, and Oracle populating each side of the 405. No, Dorothy, this isn’t Kansas, it’s Irvine. 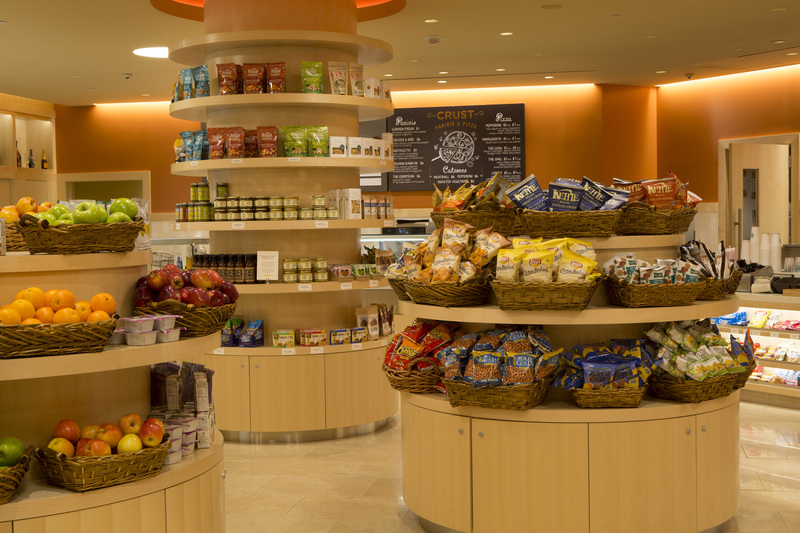 If you’re staying here, this yummy place offers well-made grab and go sandwiches, pizzas, and salads throughout the day. However, it’s the ideal spot to grab a great sausage and egg on an English muffin ($3) or a breakfast burrito ($4). Want to order a la carte? Go for scrambled eggs ($2), any breakfast meat ($2), and a side of potatoes ($2). 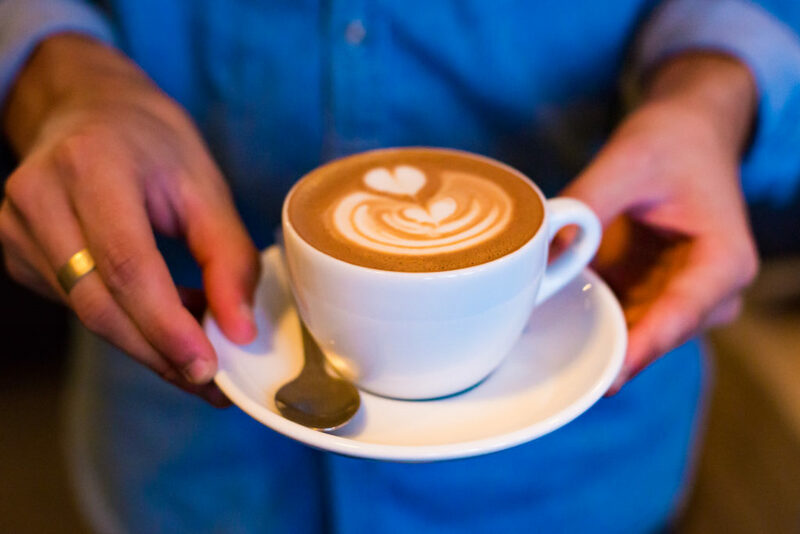 It’s far better than anything heated up at a chain coffee of fast food spot. Indeed, many of the young office workers start their days at Marketplace because the prices are low. 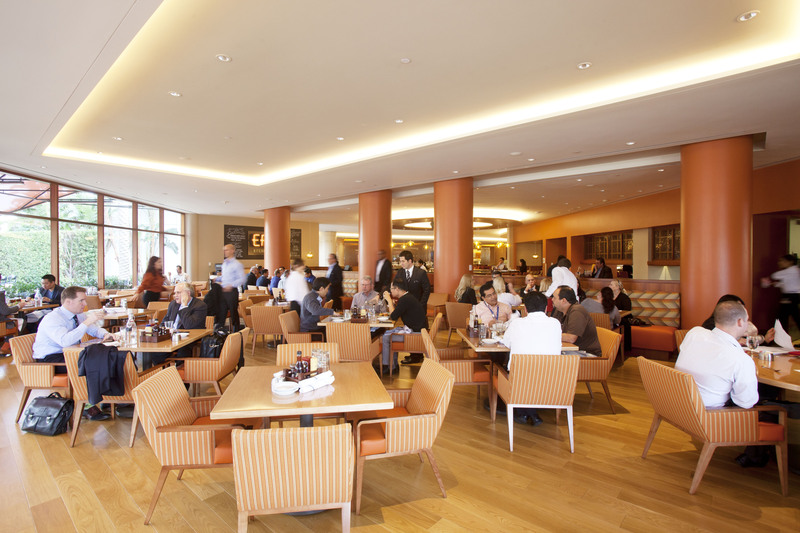 Coffee is standard Starbucks, but you can have a breakfast meeting with the ample seating. Free wi-fi included so it’s easy to start up a Powerpoint presentation. 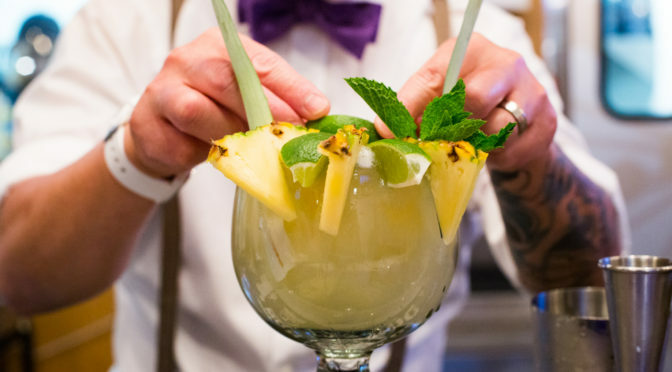 Come back during the never-ending happy hour and enjoy inexpensive glasses of wines, unique cocktails, and beer along with a stellar small plate eating menu that is equally as delicious. You did well on that 26-slide Powerpoint presentation during breakfast, but that was at 8:00 am. It took hours to get through, and you’re famished, but the chain restaurants which proliferate in Irvine – and they do – aren’t what you want. 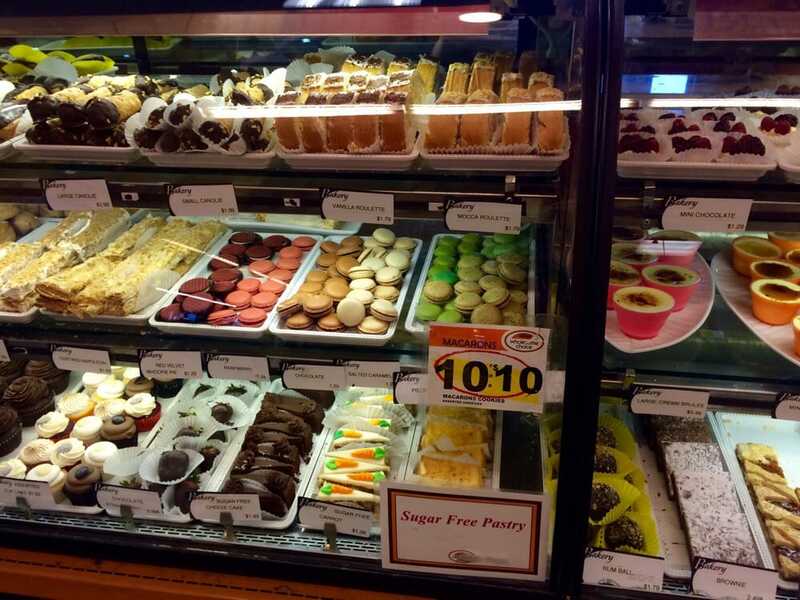 Head to Irvine’s possibly greatest food spot: a grocery store called Wholesome Choice. At lunch (or even dinner), they have one of the best ethnic food hot bars probably in the country. Running the gamut from Chinese-American, Persian, Indian, Mexican, traditional American, to Middle -Eastern, it’s a food person’s dream. Enter in on the right side by the vegetable and fruit area, and you’re walking into a Turkish bazaar stateside. The bins are overflowing with pomegranates, Persian cucumbers, key limes (in season), parsley, ginger, and other items not seen in traditional grocery stores. 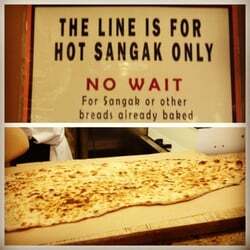 Before getting there, though, you have to sidle by the sangak bread bakery and its bakers (who are Mexican). In line waiting for the unleavened curtains of whole wheat, which drape the shopping carts, are people of all backgrounds – Latin, Korean, Jewish, Russian, Filipino, Persian, Arabic – reflecting the neighborhood and the locals. 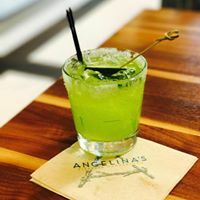 After shopping through one of the many malls, including Irvine Spectrum complete with a ferris wheel, head to Angelina’s Neapolitan Pizzeria, located in another strip area across the 405. Even though it’s a cement block with all the appeal of a wood chip, inside, the Italian bistro is light with grey, burgundy, and white. Additionally, it’s well-appointed with racks of wine bottles (mostly Italian), a full bar, and a pizza-oven creating robust aromas. Although you could order a glass of Pinot Grigio with maybe a pizza to share for as an appetizer before a meal, my recommendation is a flight of Italian food and wine. It consists of three tastes, with a trio of wines of about 3 to 3.5 ounces each. 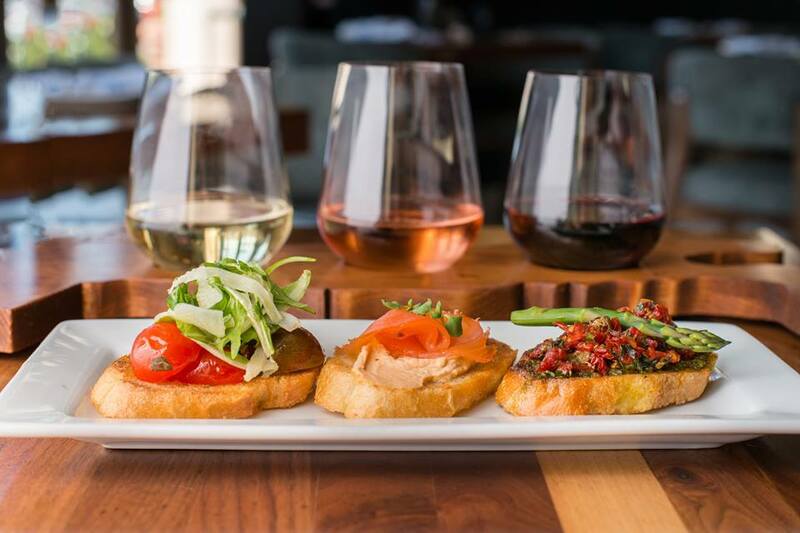 For example, the Sophia Flight ($12) focusing on rosatos, imbibers sip a sparkling from Setteanime, Raboso Marca Trevigiana, paired with a bruschetta of shrimp, garlic, and bell pepper. Another pairing is a Sangiovese rosato from Il Poggione Brancato in Tuscany coupled with a bruschetta of brie, olives, and micro-basil and lastly, from Puglia, a beautifully dry rosato, Tormaresca Calafuria Negroamaro, is combined with goat cheese, artichokes, and parsley slathered onto toast. There are others, but it’s a tasty way to travel the Italian wines without going bottle by bottle. Granted, you can do that, but there are checkpoints in Irvine. Union Market is one of my favorite destinations in all of Orange County, both for eating and retail shopping. It’s a unique one-of-a-kind retail and food hall destination showcasing the best of the independent shops. Located in Tustin, a small town to the north of Irvine, it’s based in another mall, called The District. 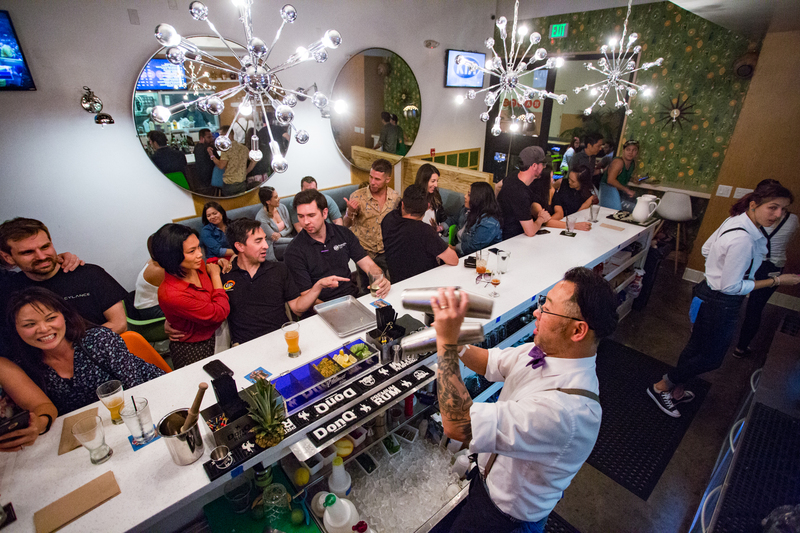 There are about seven full restaurants, including Hatch which serves only sliders, Kettlebar, a New Orleans steam cooking experience, and several others. In the center of the mini-mall within a large mall – sort of like the Russian stacking dolls — lies a horseshoe shaped bar, appropriately named Central. 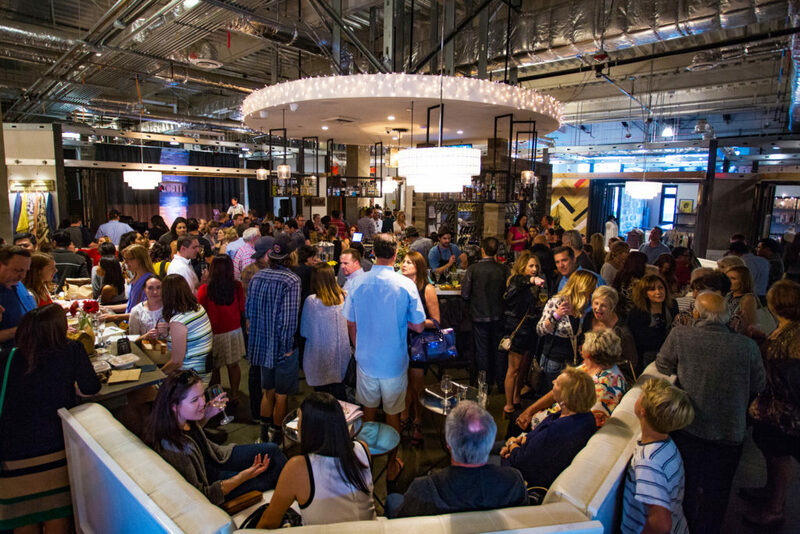 Here you will find locally-sourced beers, hand-picked wines, and craft cocktails served to a robust gathering of area workers. Order a deliciously messy Country Fried Chicken Poutine ($9) from The Kroft (the tagline is “comfort food re-invented.” ‘Nuff said. ), or Market 2 Table’s freshly made rigatoni served with Bolognese ($8.95), and eat at any of the tables. How much fun is doing a buffet to your liking? Across the parking lot from Angelina Neopolitan Pizzeria lies a Mexican restaurant created by three brothers in San Diego. 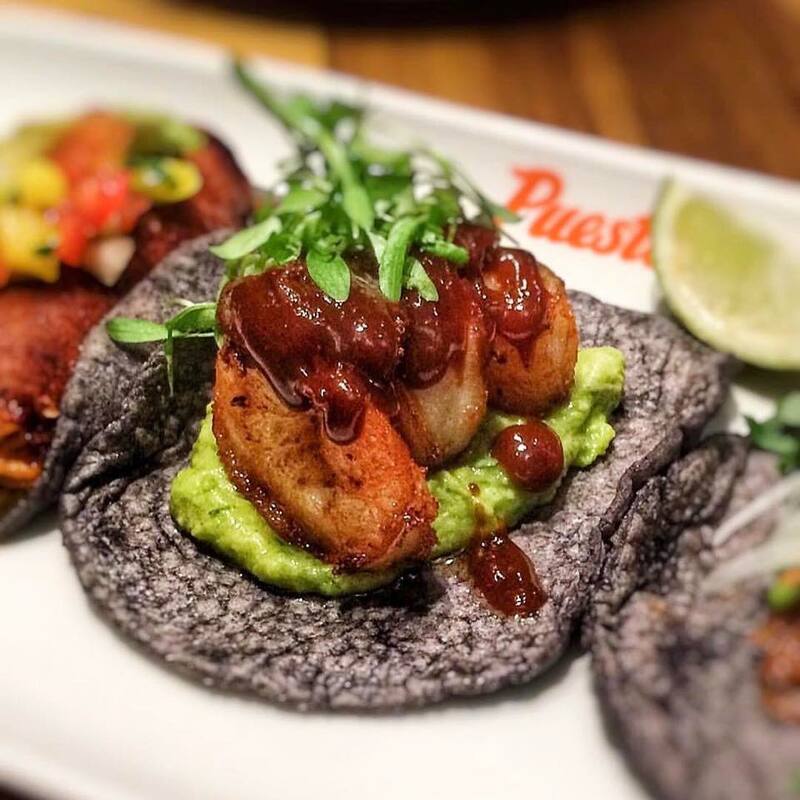 Offering a variety of tacos and other South of the Border goodies, Puesto is a unique offering in the world of California Mexican food. Begin the evening in the kitchen, where four dining tables are close to the culinary action. If the meal conversation lags or your companion is completely dull, start watching the sous chefs make batch after batch of perfectly pressed blue corn tortillas. 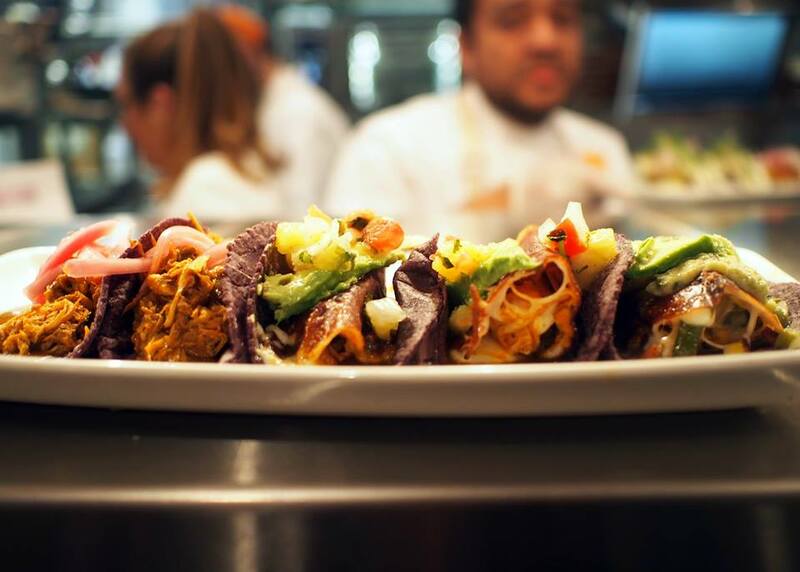 Monthly, their Executive Chef Katy Smith creates a taco, of which a dollar from each sale goes to a local charity. It’s not always a taco, either. Sometimes, it’s a margarita, and in April of this year, a frozen horchata was chilled up. The inspiration comes from a variety of Mexican states, including the street food of Distrito Federale. It’s also one of the few restaurants where I’ve had freshly made chicarrones (pork skin deep-fried). Lightly salted, they can be a gluten-free or an alternative to corn chips. Fresh, intensely flavorful, and charitable all at the same time. What more can you want from a dining experience? 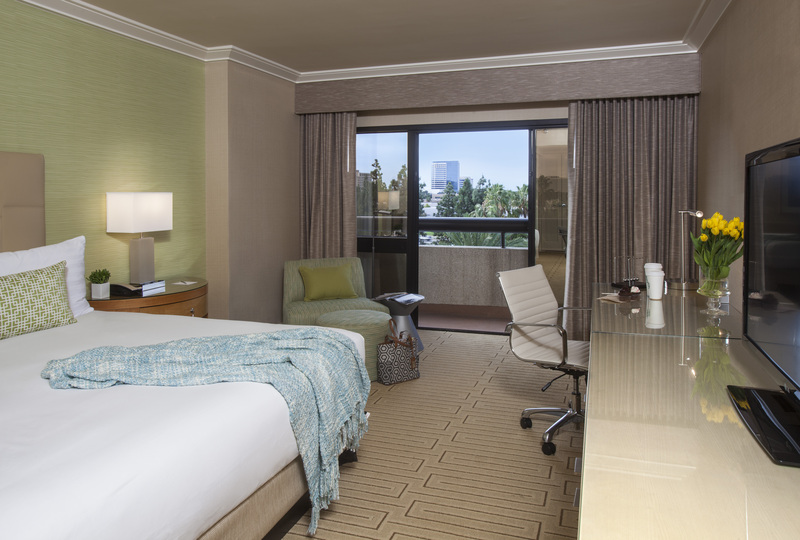 Within the confines of staying in the city area of Irvine, hotel choices are limited. However, a nice casual business stay is the Hotel Irvine. Looking more like a seventies securities exchange building, the 536-room property is nicely appointed – free Wi Fi – with a thriving food scene. Some of the rooms have balconies but overlook a business park and freeway. Regardless, it’s a quick escape from either North or South on the 405 and comes complete with a pool. (My motto: No pool. No stay.) The restaurant is called Eats Kitchen & Bar, which in January changed executive chefs. 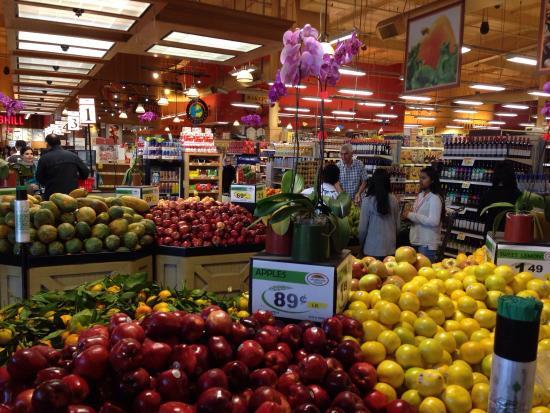 It’s now overseen by Jeff Moore, who comes from a fourth generation Palos Verdes-based grocer. The atmosphere of the restaurant is conflicted between being a gastropub, as is seen in the décor, and an industrial edifice. 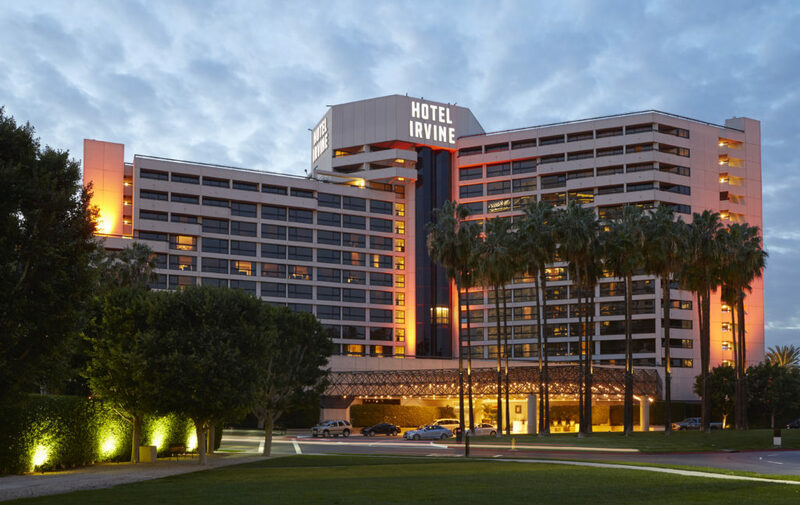 Regardless, it’s a great place to stay – hell, it’s really the only place to stay in Irvine.